Bloomin' 'Eck! Bloomberg hits the DAB iceberg! 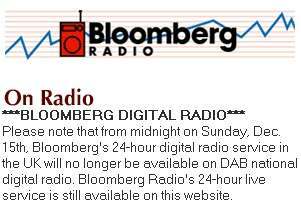 Hot on the heels of ITN News Radio's demise on DAB digital radio follows news of financial news station Bloomberg Radio's decision to stop broadcasting on the digital platform. The station, with the tagline "Essential money news for the private investor", ceased broadcasting on the national commercial digital radio multiplex on Sunday, 15th December. The station continues to be heard on the internet. With a gaping hole now left in the national digital multiplex run by Digital One, it's not yet certain which type of services might replace ITN News Radio and Bloomberg Radio. The decision by Bloomberg leaves the national multiplex without a dedicated news service of any kind. The Radio Authority recently extended the time limit imposed on Digital One to find a suitable service to replace ITN News Radio, from the original three months. national radio stations, on this website. guide to DAB digital radio, on this website. a guide to DAB digital radio products, on this website. what and where to buy DAB digital radio, on this website.